We Are The Best! Movie Review - Are You Screening? You may be able to get all you need to know about the Swedish film, We are the Best!, from the fact that the official synopsis contains the statement, “We are the Best! is a paean to DIY culture and the power of rebellion.” This is true both because our three heroines actually rebel against nothing, in that magical, teen angst sense of rebelling simply against not rebelling, and because a piece of promotional material uses the word “paean,” and couldn’t care less if you know what it means or not. It’s a film so unique that many will struggle for a label, and mistakenly come up with “coming of age,” simply because it depicts young teens. It’s actually far more accurate to think of it as something like the opposite of a coming of age story. Our heroines do not especially change, grow, or move into adulthood. Instead, they celebrate their youth, and moreover, all the things about youth that adults want them to abandon. They rebel despite having nothing much to rebel against, and they embrace their worldview, and their world order, while recognizing the largely senseless nature of their attitudes and ideals. 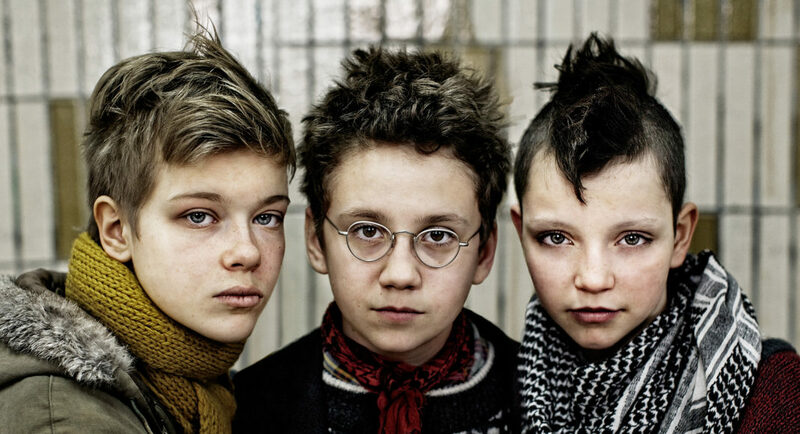 Where science-fiction often hopes to stir thought on the difficult questions of life and love using situations that are impossible, writer-director Lukas Moodysson aims for the same result by way of the most mundane and commonplace example, your average 13-year-old. Bobo (Mira Barkhammer) and Klara (Mira Grosin) are best friends, and outsiders at the local middle school. Bobo is a little too plain, and isn’t interested in participating as a general rule, and Klara is outwardly opposed to anything that might make her seem as though she were trying to fit in. They’re both fans of punk music, both despite and because of the fact that everyone keeps telling them punk is dead. Klara’s older brother, by the way, used to be cool, but now he listens to Joy Division. There are countless paths in front of this story already, but We Are the Best! ignores them all. It isn’t, says the film, that these girls can be used to deliver the statements I want to make, but that they make one already. In a clever display of the randomness of the universe influencing our lives more than we ever appreciate, the girls form a band simply for the convenience of a way to thumb their nose at some rude boys who also frequent the local rec center. Wonderfully stuck in their own display, they almost instantly become completely dedicated to the idea. This leads Bobo to the idea that they should perhaps befriend Hedvig (Liv LeMoyne), a classmate who can actually play guitar, but who is so “outside,” that even they look at her funny. From here the movie touches a wide variety of life, but it sticks mainly with a shockingly astute portrayal of friendship, and wickedly funny examination of just what the hell it is we’re outside of. Bobo and Klara, who can barely be said to act like they like each other in the first place, now pull Hedvig into their group, and admittedly with an agenda in mind. Are they friends? Are any of them friends? And, what’s the lie we tell ourselves that makes us think we ever act any differently? Then it all spins into an unnerving microscope we didn’t realize was aimed at us. It’s largely wrapped up in a fantastic ode to joy, held together by apprehension, and an overriding sense that at any moment we will realize that we don’t know what we’re laughing at, but Bobo’s uncanny ability to look in the mirror doesn’t go unnoticed. There is a fun, light-hearted ease to everything, sold best because the girls do not have the troubled lives that their commitment to rebellion would seem to require, but these are world weary teens who are equally prone to wild, even manic, fun, and reserved thoughtfulness. Here too, at every step, they betray us. Klara is desperate for some convictions, and rallies against nuclear power, but in that wonderfully logicless sense that most people never grow out of, which is to adopt a position first, and then relay information both misunderstood and misapplied, because we think it might support the point we want to have. Movie Review: Swedish teen girls go punk, circa 1982, in the irresistible We Are The Best!